It is less than a week until Christmas! Are you ready yet? If you are like me, you probably have a gift or two that you still need to buy, but with time or money (or both) running out, what's a girl to do? I have an idea that just might come in handy in the last minute gift department. I love this old Sarah Coventry pin; it reminds me of my mother. And you can wear it lots of different ways, too: A sophisticated, Audrey Hepburn-ish way to wear a Scarflette. 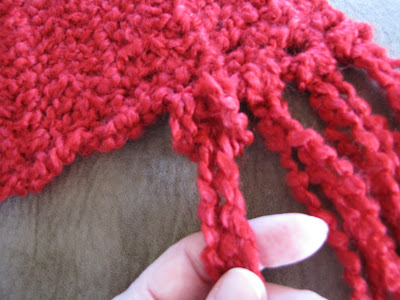 Note: Fringe is worked in ends of rows on one side of Scarflette. For each Fringe, cut 2 strands of yarn, each 12” long. Holding both strands together as one, fold strands in half. Insert fold in end of first row on one side of Scarflette. Pull fold about 3” through sp, insert ends of strands through fold. Pull ends to tighten. Fringe in end of each row across same side of Scarflette. 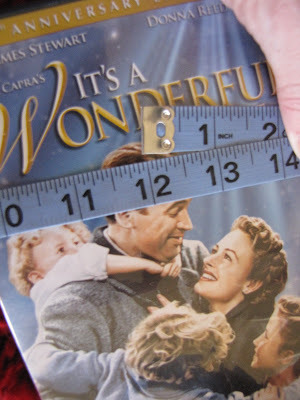 Measure around a dvd case or book to find one which has a circumference (I hope that is the correct word; I mean the measurement around it) equal to the length you want your fringe to be: We want each strand of our fringe to be 12" long, so this case will work nicely. Plus this is my favorite Christmas movie, so it I can watch it while I work! Wrap the yarn the number of times needed for the amount of Fringe you will need. We are putting two strands in the end of each row. There are 30 rows, so we will need to wrap the yarn 60 times around the case. Spread it out evenly, and don't wrap it too tightly. Now cut the strands as evenly as possible. 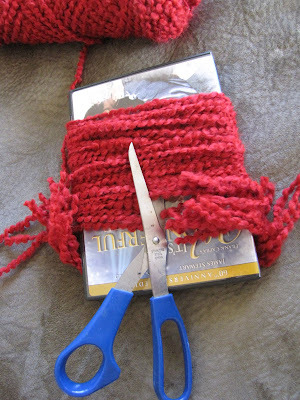 You can always trim the fringe after it is on the Scarflette if it looks too uneven. Fold two stands of the cut yarn together for each fringe. Pull the fold through the end of the row with your hook. 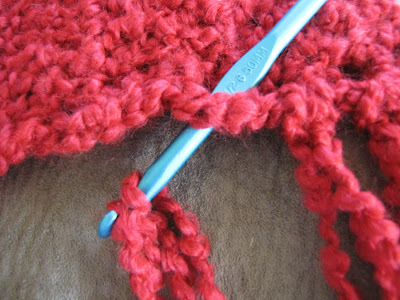 You will actually be working around the post of the last stitch on each row. Pull the fold out a little. Insert the ends of the fringe through the fold. 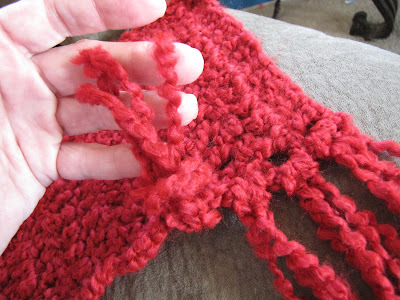 Pull the ends to tighten the fringe. 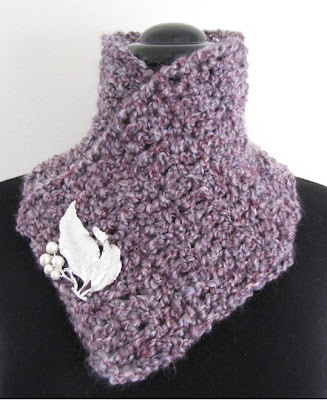 Here is another way to wear the Scarflette. I hope you will enjoy this pattern. Merry Christmas! Copyright BellaCrochet 2009. All rights reserved. Love it! Great pattern,thanks for sharing. You are welcome, Glor! I am glad you like it. oooooo!! so pretty! 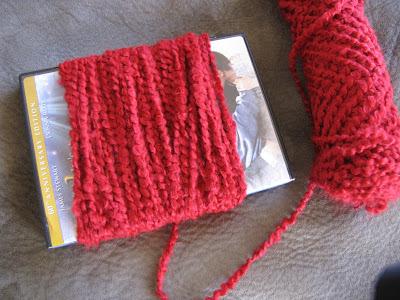 I'm going to see if I have some bulky yarn in my stash. will need to try this one out. BTW, I made some of the gingerbread people, but using a #10 thread; they came out tiny, perfect for gift tags! Thanks for the wonderful freebies. This is the best Christmas present ever. 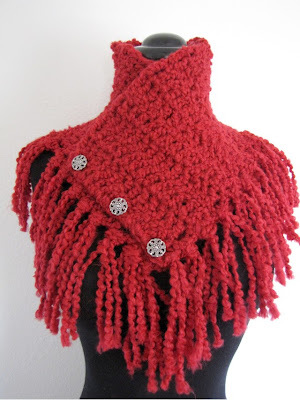 A great project to do over the holidays and a great new accessory for the new year. I made some Gingerbread boys from size 10, too, Ana Luisa, but I had trouble decorating them. I am glad yours turned out well! Thank you, Anonymous (hey, this is kind of like having a secret admirer!) I am glad you like the pattern! Thank you Ann, this is just beautiful!!! Ohhh so pretty thank you very much!!! Thank you so much for sharing this pattern with us! You are welcome, Anne! Merry Christmas! You are welcome, Unique2wh0! I am glad you like it! 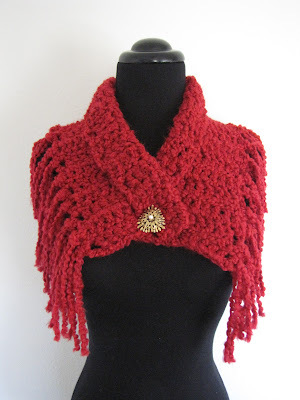 Oh Sherri, I love when folks make one of my patterns as a gift! I hope you mother will like it. Merry Christmas to you and your loved ones! Thank you LiviaY! I hope you will enjoy it! 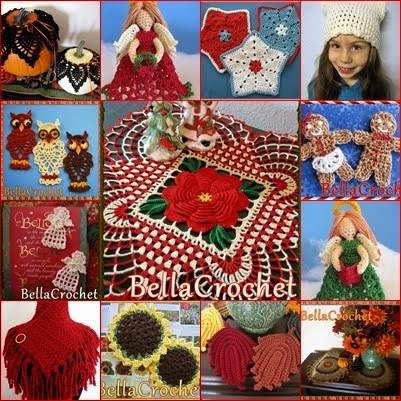 I know, there just never seems to be enought time for all the crochet projects we want to make, does there Beansieleigh? But this is a fun project to make any time (well, maybe not in August!) I hope you will enjoy it! This project looks really cool. So quick too. This Homespun wool looks really nice. I've seen it alot on the net. Looks so good to work with. Looks as though it grows quickly. Must have done if you got it done so quickly. Thank you!!!! I Love this pattern. This was a fabulous pattern. Whipped up several during the bowl game marathon. Several more coming through the football playoffs. Thanks so much for sharing. I absolutely LOVE this! Thank you for sharing. I am going to try this out as soon as my purse is completed, just need to tie in some ends and make a flower button!!! I love THIS! Thank you for sharing. 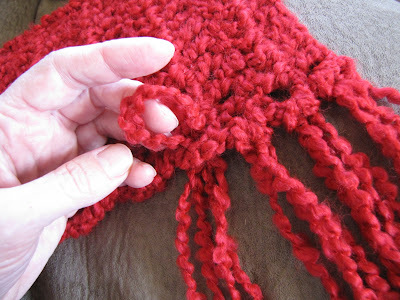 I am off to finish my purse - need to tie some ends in and make a flower button. 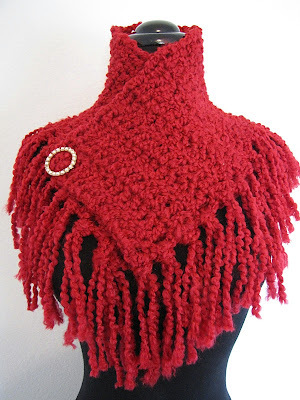 Then it will be scarflette's for Christmas! Wow! 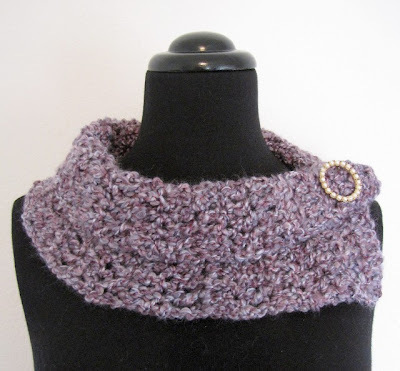 I love this scarflette pattern. How generous of you to gift us with it. I cant wait to make it!!! Beautiful scarf!! Can't wait to make several for myself & several for friends & family! Thanks so much for the pattern! Beautiful scarf! Can't wait to make several for myself & several for family & friends. Thanks for the pattern! Thank you so much, Ann! This will be a wonderful gift!! Just found this pattern, love it! I will be making some of these for gifts, thanks for sharing it. So adorable, just love the version of wearing it on the side. Am going to make one of my friends this and also one for me. Thank-you so much for sharing with us. OMG girl the styles I love it I'm game I'm making scarfs for the ladies at my husband dialysis and this would be a great Xmas present. Olive it, thank you so much for sharing your project.